Much has been made for at least two hundred years of the blissful life that is led in the open leas, away from the city. The closer we live to nature, it has been said, the closer we will be to discovering who we really are. That’s how Wordsworth described this notion in the concluding lines of Intimations of Immortality from Recollections of Immortality. Jill and I spent most of our adult lives out there in the green pastures of the suburbs, in a house that sat on nearly an acre of ground. And I tended to a lot of flowers and mowed the lawn and often had deep thoughts while trudging behind the mower. But in all that time I never saw a Great Blue Heron. 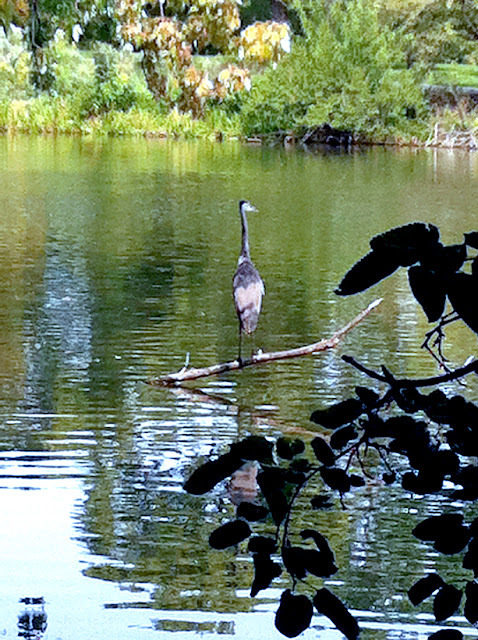 But as she and I walked along the North Pond in Lincoln Park last weekend, we saw one, just sitting on a fallen branch just off the western shore. Finally, she took off (the bird, not Jill), and T-H-A-T was an impressive sight. Ardea Harodias has a wingspan of over six feet, longer by far than its height, which is on the average a few inches above four feet. Watching that majestic bird sail on those wings to the farther shore reinforced something that I have come to see in the half-dozen years we have spent in this great city. There is plenty of nature here, too. Unlike the suburbs, where I most often had to drive out to a forest preserve to find it, here it’s right outside the front door. Another reason to love this place. Nature even in the city! Nicely done! The Fountain of the Great Lakes--Happy Birthday!